Above & Beyond Unlimited Cleaning Company is dedicated to serving each customer in a special way, providing the highest level of service. Each assignment is taken on with the intention of meeting and exceeding EPA guidelines. Thousands of satisfied customers testify that once we enter your home or business, we give an individually tailored experience aimed at customer satisfaction. With a 24 hour emergency service that guarantees fast response times, you can be sure that Above & Beyond is designed to provide you with first-rate service in a timely fashion. Call us today to experience our prompt service. We value your peace of mind and we understand the importance of the safety of your home. We are therefore prepared to walk you through all the work that will be done on your home to ensure that you fully understand and comply. We will live you not only 'mold-free', but also 'worry-free'. We handle a variety of procedures, ranging from flood-damage cleanups to mold remediation and basements waterproofing; with a competent team of experts at your disposal, Above & Beyond is basically a 'one-stop-shop.' We work to return your home to its optimal state so even you can forget that any damage ever happened. Above & Beyond is prepared and equipped to handle projects of any size, at both commercial and residential sites. Since its establishment in 1998, Above & Beyond has grown to incorporate a team of more than two dozen proficient employees and ten trucks; a combination that enables us to work on several different projects simultaneously. We are based in Mercer County but our service area extends across the entire Tri-State region. Our main priority is customer satisfaction - and we strive to serve each customer with integrity and diligence; we will never leave a customer unsatisfied! Above & Beyond is a fully insured, licensed and bonded company that is ranked A+ on the BBB. Our experienced technicians are MICRO CMI & CMRC, ESA and IICRC certified. We guarantee the highest level of customer service, matched with the highest quality of workmanship form the entire team at Above & Beyond. We are proud to offer first-class customer service, all at reasonable prices; with our 'best-price guarantee', we are able to meet and beat the prices of anybody else in the market! 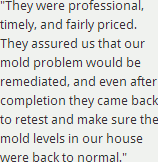 We recognize that dealing with these types of services can be daunting, so our motto is to make the remediation process as painless and stress-free as it can be. We can communicate directly with your insurance company to take some of the pressure off your shoulders. Call us now (732) 490-5900 to get a FREE over-the-phone consultation. Somerset County, Essex County, Morris County, Warren County, Union County, Camden County, Bergen County, Middlesex County, Cape May County, Hunterdon County, Atlantic County, Mercer County, Gloucester County, Monmouth County, Sussex County, Passaic County, Salem County, Hudson County, Burlington County, Ocean County, Cumberland County.